RBI rate hike cycle – Is it back? The fact that the RBI has decided to front-end the rate hike in June before the Kharif data indicates that there is concern about the inflation and the rupee. In addition, the global price of crude oil is also a worry. Thus, we can conclude that there could be more rate hikes to the tune of another 25-50bps. When the RBI hiked the repo rates by 25bps to 6.25% on June 6, 2018, the markets heaved a sigh of relief that the outlook was not changed to hawkish. The Monetary Policy Committee (MPC) still maintained its monetary stance as neutral. While this is not really an indication of the direction of rates, it means that the RBI could move rates either ways, depending on the macro data. The first up cycle in rates was in the year 2000 at the peak of the technology boom. With the Sensex touching new highs and huge wealth created by IT stocks, the RBI had moved in to hike rates to control inflation. However, this had to be given up post 9/11 in September 2001. The second rate hike cycle happened from 2005 onwards and continued well into 2007. However, post the Lehman crisis of 2008 central banks across the world cut rates drastically and the RBI also had to follow suit. The last phase of rate hikes happened when Dr. Subba Rao hiked rates by nearly 400bps post 2010. Post the 2013 currency crisis, the RBI did adopt a more dovish stance. But the real rate cuts in the light of falling inflation and lower growth started from January 2015. This dovish approach has sustained till date. At the outset, the rate hikes from here on may not even remotely resemble what happened in 2011. A 400bps rate hike almost looks unlikely at this point of time. However, the fact that the RBI has decided to front-end the rate hike in June before the Kharif data indicates that there is concern about the inflation and the rupee. In addition, the global price of crude oil is also a worry. What we can conclude is that while there could be more rate hikes to the tune of another 25-50bps, it is unlikely to go beyond that. There are four reasons for this perspective. Despite worries on the Kharif MSP front, the RBI has maintained inflation in the range of 4.7%-5.1% in the first half of the fiscal and at 4.4% in the second half of the fiscal. That largely rules out the risk of runaway inflation in the current fiscal. Global Brent prices may have hit a temporary resistance at around $80/bbl. The US has already warned that if OPEC does not increase output then the US oil would flood world markets. For now the oil rally may halt although India’s trade deficit will continue. Among the six members of the MPC, Dr. Ravindra Dholakia has been a consistent dove. Even he has voted in favour of a 25bps rate hike. That means, although the stance is neutral, it shows a tendency towards turning hawkish. The RBI will have a delicate balancing act to perform. The rupee has to be protected around 68/$ to prevent a run on the rupee. At the same time, the yield differential on Indian bonds has to be sustained at a time when central banks worldwide are getting hawkish. The answer is to hike repo rates by another 25-50bps. For now, the view appears that dovishness is not an option any longer. While the RBI may be more calibrated in its approach, hiking rates by another 25-50bps would help the RBI hit many birds with one stone. It will address the challenges of inflation, rupee weakness, trade deficit and foreign portfolio flows. What will another 25-50bps rate hike mean for investors? A rate hike will mean a rise in the rates on deposits and on borrowings, as we have already been seeing for some time now. 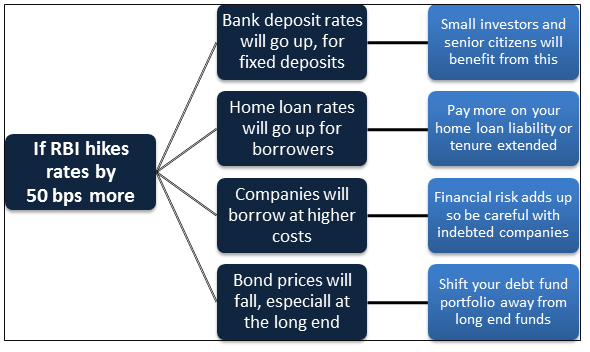 Here are three implications for investors and borrowers. Loans will get costlier if rates are hiked further. So your variable rate home loan will cost you more per month. Of course, normally home loan EMIs are not hiked but it is the tenure of the home loan that is extended. If you are invested in equities or equity funds, then there are two implications for you. Firstly, keep a watch on your portfolio if there are companies that are heavily indebted. They may have to renew their loans at a higher cost. Secondly, be cautious if the portfolio of your mutual fund is heavy on rate sensitives. They could face bond portfolio losses and also slackness in loan off-take. If you are invested in debt mutual funds, your portfolio of long dated funds could be in trouble. Normally, long dated funds are most vulnerable to rate hikes and tend to lose more value. Get prepared for NAV Depreciation. To sum up, it looks like another couple of rate hikes in the offing. It may be too early to conclusively say if the rate hike cycle has turned upwards.